There are good bus services to the beaches and Ano Mera. Buses to Platis Yialos and Ornos leave from the south bus station while to Kalafati and Elia from behind the OTE. The beaches are also linked to Mykonos harbour by regular boats. 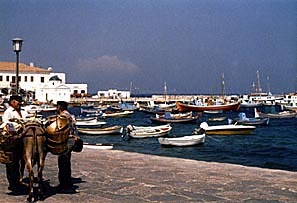 Taxi station is on the central square of Mykonos waterfront.